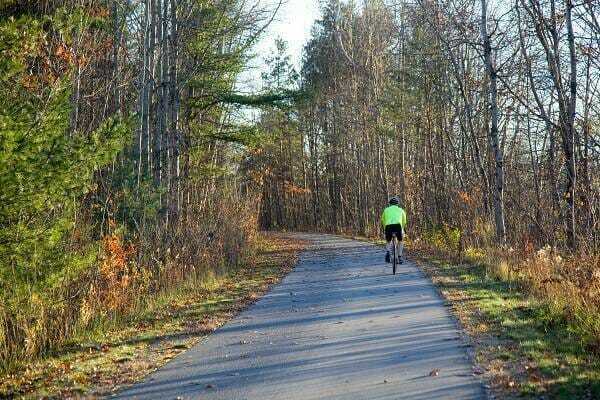 The White Pine Rail Trail is the longest rail-to-trail linear state park, spanning 92 miles connecting Grand Rapids to Cadillac. This trail crosses 5 counties and 14 open deck bridges, the longest one measuring 319 feet spanning the Muskegon River. In Cadillac, the White Pine Trail connects to a larger local trail system that encircles our lakes and connects our communities. During Spring, Summer and Fall the trail offers scenic foliage, fantastic rails to trails terrain, and unique communities along the route. The trail is paved making it a great beginner trail for both walking and biking. There are benches and restrooms along the trail. Looking for a longer trek? This out and back trail leads south 11.7 miles to the city of Tustin. The trail is open to skiing in the winter months, and is also a trail for snowmobiling. Snowmobiling is permitted from Cadillac south to the Russel Road staging area in Cedar Springs. In order to protect the pavement on some sections of this trail, snowmobiling is only allowed when the snow base reaches a minimum of 6".